Hanukkah is coming up - the Jewish festival of lights begins on Saturday, December 8 and runs until Sunday, December 16. During this time, Jewish families will gather to celebrate the fun and historical winter holiday. If you have a loved one who normally lives in a retirement community but will be visiting you this year for part or all of the festival, here are some ideas on how you can make sure he or she is included in the activities. No Hanukkah would be complete without a bit of decoration. While hanging lights outside may not be the best activity for a senior loved one, there are still plenty of festive ways to decorate that are safe and fun. Have your senior loved one help you and your family create banners, paper dreidels or other items that can be hung around the house. If you keep your decorations in a box, you can have him or her help you unpack it and place your yearly decor around the home. One of the best parts about Hanukkah is the food. Latkes, matzo bread, kugel and brisket are just some of the delicious dishes that families like to prepare around this time of year. Cooking can be a fun activity for older adults, and it may help stimulate their brain. This year, invite your loved one into your kitchen so they can help your prep and cook your favorite Hanukkah cuisine. 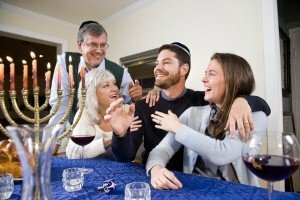 Hanukkah is a celebration that families should spend together, and this means the senior in your life will have the opportunity to regale his or her relatives with stories of holidays gone by. You can invite your loved one to tell personal stories or ask him or her to talk about the history of the holiday.